In the mid 19th Century the American cowboy occupied a place sufficiently important to entitle him to a considerable share of public attention. His occupation was unique. In the exercise of his function he was always a man on horseback. His duty as a worker in the cattle business was, at times, to ride over the range in order to see that straying cattle did not rove too far from the assigned limits; at times to drive the herd from one locality to another; and at times, to round up the dispersed cattle, by which is meant to collect them together for the purpose of branding calves, or of selecting beef cattle, which latter were driven to railroad stations for shipment to market. The chief qualifications of efficiency in this calling are courage, physical alertness, ability to endure exposure and fatigue, horsemanship, and skill in the use of the lariat. 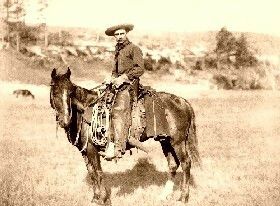 The original cowboy of this country was essentially a creature of circumstance, and mainly a product of western and southwestern Texas. Armed to the teeth, booted and spurred, long-haired, and covered with the broad brimmed sombrero the distinctive badge of his calling, his personal appearance proclaimed the sort of man he was. 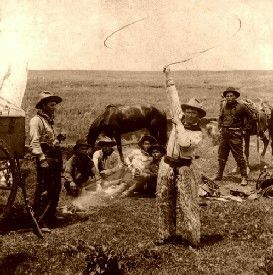 The Texas cowboys were frontiersmen, accustomed from their earliest childhood to the alarms and the struggles incident to forays of Indians of the most ferocious and warlike nature. The section of the State in which they lived was also for many years exposed to incursions of bandits from Mexico, who came with predatory intent upon the herds and the homes of the people of Texas. The carrying of firearms and other deadly weapons was consequently a prevalent custom among them. And being scattered over vast areas, and beyond the efficient protection and restraints of civil law, they of necessity became a law unto themselves. It is not a strange thing that such an occupation and such environment should have developed a class of men whom persons accustomed to the usages of cultivated society would characterize as ruffians of the most pronounced type. But among the better disposed of the Texas cowboys, who constitute, it is believed, much more than a majority of them, there were true and trusty men, in whom the dangers and fortunes of their lives developed generous and heroic traits of character. The same experiences, however, led the viciously inclined to give free vent to the worst passions. Upon slight provocation they would shoot down a fellow man with almost as little compunction as they fired upon the wild beasts. But the peculiar characteristics of the Texas cowboys qualified them for an important public service. By virtue of their courage and recklessness of danger, their excellent horsemanship, and skill in the use of firearms, and by virtue also of the influence which they have exerted upon their gentler brethren of the northern ranges, they have been an efficient instrumentality in preventing Indian outbreaks, and in protecting the frontier settlements of the entire range and ranch cattle area against predatory incursions and massacres by Indians. This has been a natural result of the fact that the cowboys constitute throughout that region a corps of mounted scouts, armed and equipped, twenty thousand strong. They traverse vast ranges, ford rivers, and search for cattle amid mountain fastnesses and in lurking-places of the river bottoms. It is only twenty years since the discovery was made that between the line of settlement in Dakota, Nebraska, and Kansas at the east, and the Sierra Nevada and Coast ranges at the west, there was an area as large as the portion of the United States which is situated east of the Mississippi River, throughout which cattle could be raised and fattened on the open range, seeking their own food, water, and shelter without any aid from man, from the time they were dropped until they were in condition to be driven to a railroad station for shipment to market. This discovery, greater in its importance than the discovery of gold in California, or silver in Nevada, or petroleum in Pennsylvania, happened, according to the most reliable accounts, in this wise. Early in December, 1864, a government trader, with a wagon train of supplies drawn by oxen, was on his way west to Camp Douglas, in the Territory of Utah, but being overtaken on the Laramie Plains by an unusually severe snowstorm, lie was compelled at once to go into winter-quarters. He turned his cattle adrift, expecting, as a matter of course, they would soon perish from exposure and starvation, but they remained about the camp, and as the snow was blown off the highlands the dried grass afforded them an abundance of forage. When the spring opened they were found to be in even better condition than when turned out to die four mouths previously. This at once led to the experiment of herding cattle on the northern ranges. But it was for years a slow and hazardous business. 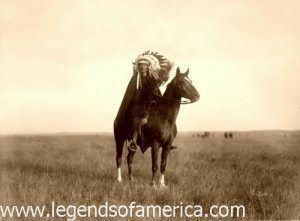 At that time it was the custom to allow the Indians upon the reservations to wander off during the summer months throughout the present range and ranch cattle area, in order that they might hunt buffalos and other large game, and then sustain themselves in their accustomed way until the approach of winter, when they returned to their reservations to be again provided for by the government. Permission to depart on these expeditions was always given upon the promise made to the military and civil officers of the United States that while absent they would be good Indians. But as cattle were more easily caught than buffalos, they found it greatly to their advantage to swoop down upon the herds, stampede them, and slaughter at their leisure as many as their needs required. This cowboy is “forking” a horse. Often times, by way of amusement, they lifted the scalp of a stray cowboy. In many instances they massacred whole camps of settlers, whose chief occupation was cattle herding. Occasionally these wards of the nation so far forgot themselves as to put on war-paint and set the United States at defiance. The massacre of General Custer and his detachment on the 25th of June, 1876, at Little Bighorn, Dakota, near the present location of Fort Custer, led, however, to the adoption of a more stringent policy on the part of the United States government with respect to requiring the Indians to remain upon their reservations. During the five years following that tragic event our valiant little army, widely scattered over a vast area, had many bloody encounters with the savages. At last the spirit of resistance was broken, and Montana, Idaho, and Dakota became comparatively safe for the introduction of the range cattle business, which had already become known in Colorado and Wyoming as a highly attractive enterprise and a speedy avenue to wealth. As the work of the army drew nigh to completion the cowboy galloped in, and became the mounted policeman of a vast area, always on patrol. But even after the red man had retired to his reservation the lot of the cattlemen were not entirely serene. From time immemorial the horse thief and the cattle thief seem to have been a sort of parasitic growth upon frontier life, apparently begotten of its conditions. So it was on the range. 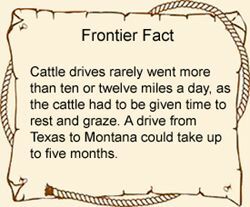 For several years the entire region from Kansas and Colorado at the south to montana and Dakota at the north was infested by cattle thieves. The country afforded apparently illimitable scope for this nefarious traffic.